On the one year anniversary of the Cathedral Yard fire, Devon & Somerset Fire & Rescue Service are reminding owners or managers of heritage buildings of the importance of carrying out and regularly reviewing their Fire Risk Assessment . Within Devon and Somerset there are a large number of historic buildings, approximately 19000 and 12000 respectively, some of which are listed and are deemed to be of considerable significance and importance. Safeguarding heritage buildings from the ravages of fire is vital to conserve the historical record for future generations as well as ensuring the treasures within will be preserved and enjoyed for many years to come. By their very nature heritage buildings are very often more vulnerable to the effects of fire than new builds and the building’s performance against fire cannot easily be compared with any other building due to its individual and unique qualities. As buildings grow and are adapted over time, their vulnerability changes; particularly where their adaptation is uncontrolled, unregulated and there has been a failure to introduce basic fire safety measures. The introduction of new services such as pipes or wiring can lead to separating walls being breached to allow them to be passed through. Paul Bray, Community Safety Protection Manager said: “Older buildings have unique features such as hidden voids and cavities supported by dry timber construction. Fire can easily travel undetected within these voids. The challenges of fighting a fire in a terrace of ‘heritage’ or buildings of substantial age are substantial. The fact that the fire is hidden also makes it almost impossible to tackle internally and externally without a major dismantling of the building fabric. “Even with the most attentive fire prevention and protection measures (such as fire alarms and fire separation), it cannot always be guaranteed that a fire will be contained and prevented from causing destruction. It can be significantly reduced through by the development of a comprehensive pre-survey of the impact on surrounding buildings during the construction phase. If you are the owner or manager of a heritage building, there are some fairly simple actions you can take which will protect your historic building and artefacts from the damage that can be caused during a fire. These actions will lower the risk of your building being involved in a fire, and in the event of a fire or other emergency, limit the damage to your building and its contents. 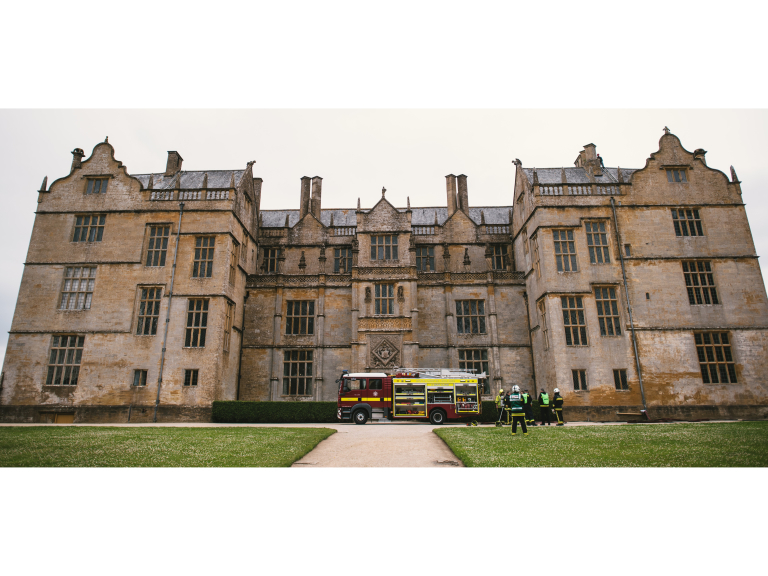 For further guidance and a comprehensive outline of some of the main hazards and considerations that you can identify to help keep yourself, visitors and the heritage value of your property safe from fire. Visit Protection of historic buildings from fire. There is no standardised format for recording or presenting the findings of a Fire Risk Assessment but in every case the goal should be to produce clear and comprehensive documentation that is regularly reviewed. When you have assessed the risks consider what you can do to reduce or eliminate those risks. Protective measures are often controversial in heritage buildings, because they can be seen as disruptive to the original fabric of the building, and the physical installation of the systems can sometimes be difficult. It is possible, however, to take suitable protective measures that are sympathetic to the historic fabric of the building, but which can also be designed for individual premises. A business continuity plan should be integrated within the fire safety management plan so that in the event of fire, restoration work can proceed as quickly as possible. Being prepared for an emergency will significantly improve recovery rate. Devon & Somerset Fire & Rescue Service are extremely grateful for the generosity and support of the people of Exeter during and after the fire. We would like to thank all members of the public, local business owners and partner agencies who assisted in bringing the incident to a safe conclusion.